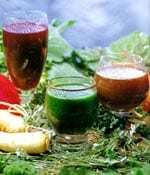 Fruit and vegetable juicing for good health from the book….The Hippocrates Diet and Health Program by Ann Wigmore ….. and WHY JUICE? Dr. Norman Walker, a centenarian health researcher, had been living primarily on fruit and vegetables for over 60 years. He felt his longevity was due in large part of the liquid oxygen, enzymes and chlorophyll contained in fresh juices.Chlorophyll is the “blood” of the plant. It is the protein in plant life that gives it its distinctive green or purple colour. When compared to a molecule of hemoglobin, the oxygen carrier in human blood, chlorophyll is almost identical. One of chlorohylls’s more important functions is to oxygenate the blood stream, tests have shown that a high fat, high protein diet will reduce the oxygen supply in our blood. We than develop symptoms of low energy, sluggish digestion, and metabolism. As for diet, all fresh raw vegetables, fruits, sprouts and greens, especially wheatgrass, have oxygen contained in the liquid. When we eat, or drink or juice and drink these foods, our blood supply of oxygen increases. Most wheat allergies are due to the gluten found in the wheatberry, but wheatgrass is cut before the plant forms a grain (berry) and therefore has no gluten. It’s an excellent addition to the diet of a person with allergies. Healthier blood can lead only to a healthier, more vital body, better able to with stand stress without injury. It is most important to use a good quality juicer to extract these juices, as the normal high speed centrifugal types destroy much of the goodness in juices. We recommend electric juicers as listed, the Lexsun Elite, the Angel or the manual stainless steel types which juice at the slowest speed to give the maximum of antioxidants.